There have been brief sightings of me recently, hopefully allaying the fears that I have gone missing. Still super busy, cramming as much as possible into each day. Hoping for at least a brief lull soon. In the brief moments before I fall asleep, I am reading The Hunt Ball by Rita Mae Brown. Yes, I am gulping these books one after another. I think I only have three or four more and I will have done the entire series to date. I'm not sure if there will be more or not--I hope so! Don't give up, my faithful readers--I will be back with more regular postings...just not yet! P.S. I have been thinking about Nancy A, Barb McA, mkmouse--how are you all? Also, Marion T, we miss you at First Tuesdays--everything okay? Okay, I am thinking about many more of you...just not naming you right here. It's just insane. I think I need to get less of a life! I have just updated my website (www.sharonstroud.com) so that you can see what classes I am teaching this fall. There is still time to sign up for a fun time. 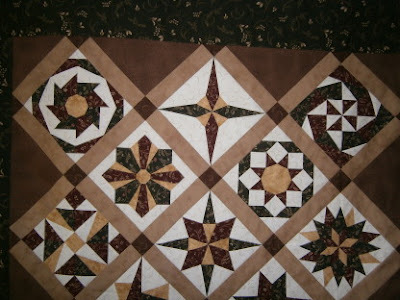 Imagine....hand piecing, hand quilting, machine piecing, hand applique. So many classes, so little time! I have literally been busy from morning to night since my last post. I am hoping for a bit more time to download pictures and tell you what's been happening. Don't give up! 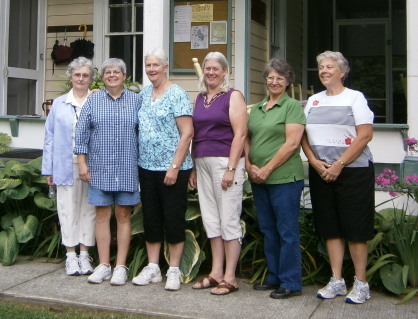 Last week I judged for the Mohawk Valley Quilt Club. Their show is September 23, 24 and 25, 10:00-5:00 each day, and it will be fabulous! So if you are in the Utica, NY, area this weekend, check out the show. 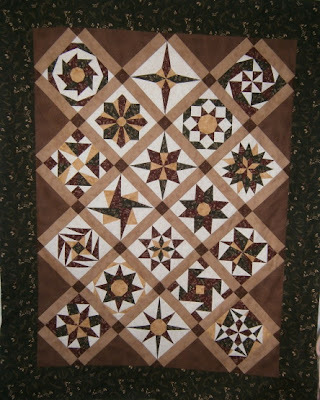 Please visit www.mohawkvalleyquiltclub.com for more information. Okay, I need to get back to my non-blogging life. Stay tuned for updates. P.S. I have listened to Crescent Dawn by Clive Cussler. And am reading Full Cry by Rita Mae Brown. P.P.S. I have the body of my sweater done and am knitting the neck/collar now. My philosophy is that something good should happen to women (and men!) every month. As some of you may know, I have had two Monthly Bliss series--10 months of hand piecing bliss. And now...drum roll, please...there is Monthly Bliss 3! Hot off the sewing machine at 3 a.m. September 1. 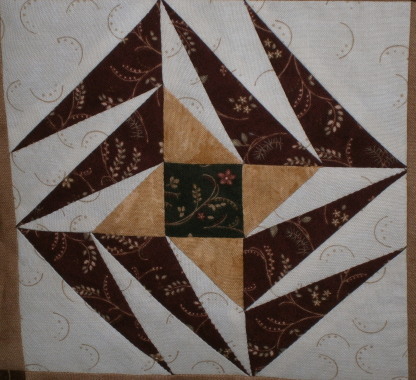 Eighteen all new hand pieced blocks. I set mine together by machine--to me the blocks are the fun part--all those set-ins and pivots, circling star points...ahhhhh, pure bliss! This entire top was made in the last four weeks. (Please remember that the pictures look weird because of my design wall--it's not stable--so things look cockeyed.) In hindsight (always 20/20) I wish I had used more contrast in the blocks. I love the richness of the green and burgundy, but they were too similar in value. But I love the new blocks and the next sample will have better contrast. One of my favorite blocks. This one looks better because there is background separating many of the pieces. If any of you are in or near Watkins Glen, NY, you may be interested in this fun, informative class. Ten months of bliss! Just think of it! For more information or to register, you can contact O'Susannah's Quilts at 607-535-6550. Plans for Monthly Bliss 4 are already under way--but I am not sewing the blocks tonight! So there you have it--a new quilt top and class. P.S. I am listening to Cold Moon by Jeffery Deaver. Thanks for the tip, Penny and Emily! See you both soon! Okay, this was a big step for me but I think most of you will be rolling your eyes wondering what the fuss was about--just sayin'. 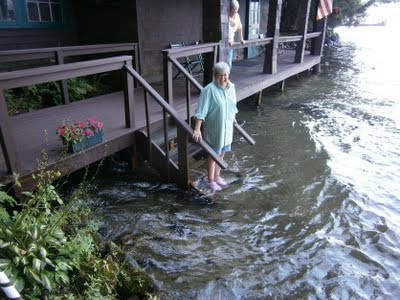 In all the years I have been going to Lake George for retreats, I have never touched the water. I like being on the water and near the water but not IN the water. With Eleanor Roosevelt's voice in my head urging me to do something everyday that scares me, I decided this was the year. For those of you who remember the early days when I wore dresses, slips, stockings and really good shoes, these images may be shocking! As the years have gone by I have become less formal in dress for retreat. Last year I was down to shorts and skirts (plus shirts!) and joked about next year maybe sandals! Well, I was as close as I probably will get. 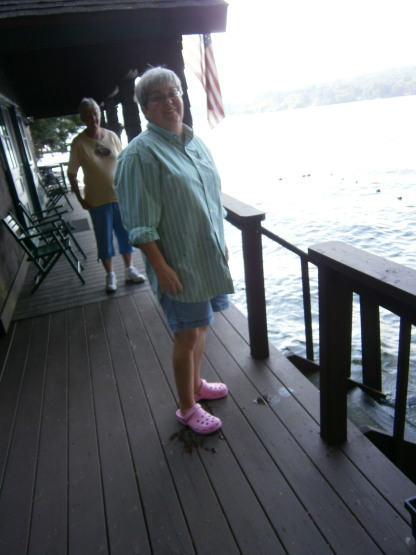 Just before retreat I got a pair of fake crocs with horsehead cutouts--in candy cane pink, no less. 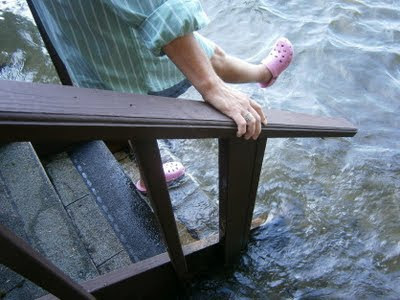 Perfect shoes for touching the water. After lunch one day, I came back to the classroom wearing shorts, shirt and pink clogs. Today was the day. (If I look fat in the following pictures, it is because there were four cameras on me--and we all know that each camera adds 10 pounds!) These pics are courtesy of Cindy--she did a great job! Death grip on the railing--on both sides! Not quite in the water. 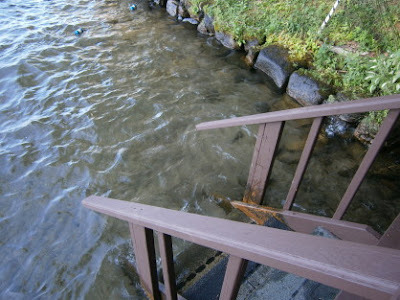 I did go down one more step than what you see...and a big wave came in! Still death grip on the railings. Even scarier was turning around to get out! I had to let go of both railings at the same time! 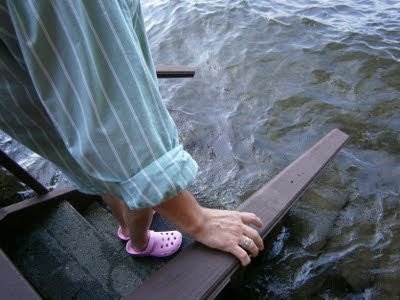 But I managed to climb the stairs and get the water out of my clogs! Mission accomplished! The ladies at the retreat were so much fun with this...I can't thank them enough. We did silly, crazy things this year and had a wonderful time. And I can say I survived Lake George! By now you are either asleep or rolling your eyes at such a display of stupidity or rolling on the floor laughing at how this could be scary at all. So my purpose as entertainment or a sleeping aid has been successful! Thanks for letting me share. Tomorrow is a quilting post--thump--was that you hitting the floor from shock? You'll like what you see! P.S. I am listening to Everlasting by Iris Johansen. Okay, even I am embarrassed! Three posts in all of August? That's the fewest number of posts in all three plus years of blogging! I'll try to do better in September. These are the "wrap-up" pictures from the retreat. 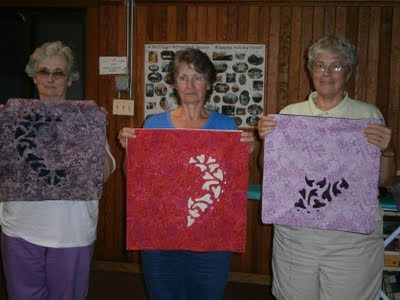 First, three ladies who braved the most intricate of the four designs. Gale, Sandy and Nancy. Sharon G, Cindy, Gale, Sandy and Nancy. 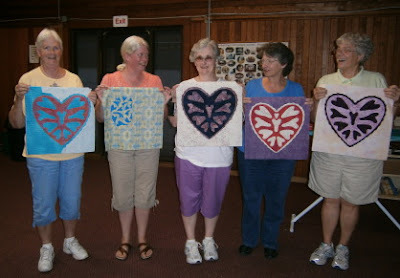 Cindy worked on the hardest design for all three days, Sharon G worked on the nine hearts for the three days, and Gale, Sandy, and Nancy completed the nine hearts project before starting the hardest one! It's fun to see what designs are chosen and how fabric choices make them look so different. Great job, ladies! And the last hurrah. We had a wonderful time, even taking time to "porch" and, of course, enjoy the Thursday night fireworks from the boat dock. It all goes by so fast. Several of us took a boat tour on Sunday morning, actually cruising on the Minne-Ha-Ha, the tour boat that comes in close to our classroom several times a day. It was fun to see things from the lake side! 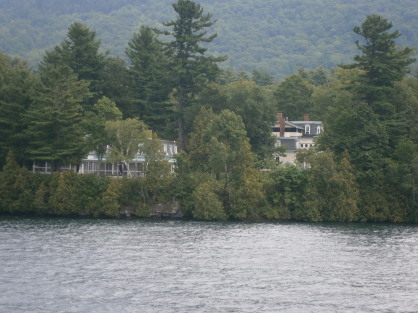 First, this is a view of Fuller (on the right) and Mayflower Cottage (on the left), and a tiny bit of Rose Cottage just behind Mayflower. And this is the House of Trix--the classroom! There is a small waterfall behind the building, so water actually runs right under the building. 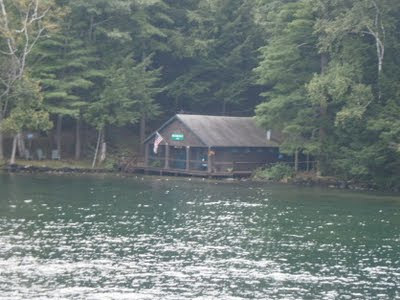 Having taken the ride on the lake, we will make even more of an effort to race to the porch to wave when the boat passes! We did a bit of shopping and eating near the docks, and then it was the mad dash for home. The time is always too short, but we make the most of every minute. Next post will be a water adventure featuring yours truly. Stay tuned! P.S. I finished listening to Crunch Time by Diane Mott Davidson and Timeline by Michael Crichton. P.P.S. Traci, the thread color is Mettler 823 in 50 wt.